He Was Moe Green, Damn It! 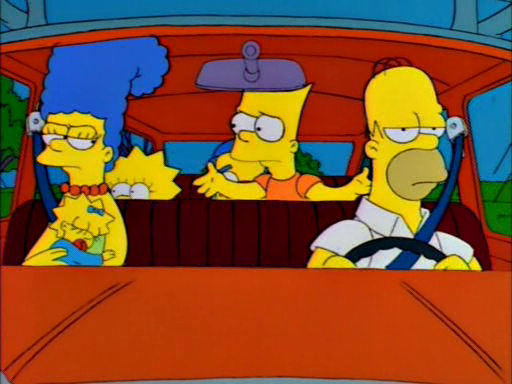 “That screwball Marge Simpson, we’ve gotta stop her! But how?” – Roger Meyers Jr.
“All your fancy degrees and that’s the best you can do? You make me sick!” – Roger Meyers Jr. If you’re feeling it, his three turns were in Season 2’s “Itchy and Scratchy and Marge”, Season 7’s “The Day the Violence Died”, and Season 8’s “Itchy and Scratchy and Poochie”. So long, Alex, nobody ever had a voice quite like yours. This week FOX announced that Chile would be getting a real life Duff variant, apparently prompted by unlicensed (and, one assumes highly popular) versions that were already on sale. This is amusing in a “merchandising rules everything around me, get the money, dolla dolla bill ya’ll” kind of way, but it seems awfully contradictory. Duff is supposed to be crappy beer that only a swine would drink, but presumably if they’re spending the money to actually make it, they won’t just turn it into the disgusting Budweiser/Miller clone it was meant to be. So it’s going to be beer that’s good to drink but inauthentic to the show, or it’ll be crappy beer that’s hard to drink but true to the source material. Either way we can complain, so I guess it’s win-win. In addition to that, we’ve got yet more high fashion Simpsons clothing, more love for Lisa, a couple of people who agree with us, street art/advertising, and the video realization of that long simmering Bartkira project. Beyond the ret-con of Skinner’s experience in Vietnam, it just doesn’t fit with the man we’ve seen in the show to that point. 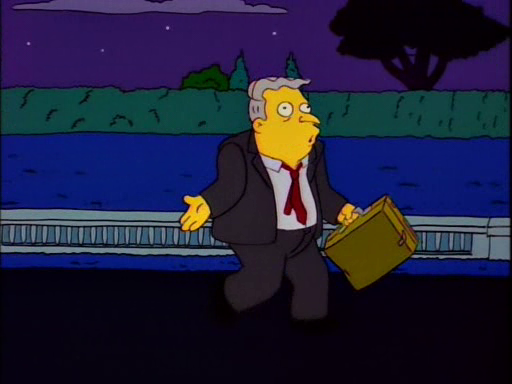 Skinner, in the Principal and the Pauper, is a chancer. Deep down, despite his bursts of cynicism (”come on Edna, we both know these children have no future!”) there’s the sense he cares for the kids, for the school and for his job. 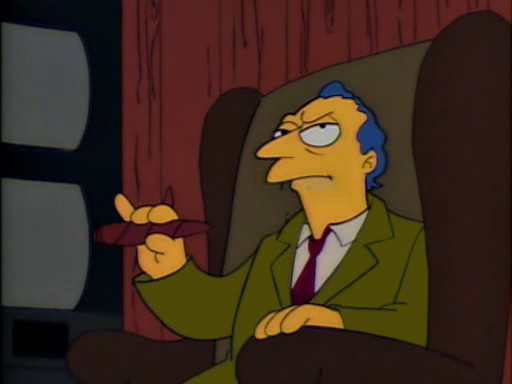 As shown in the Sweet Seymour Skinner’s Badaaasss Song, or even at the end of the The Boy Who Knew Too Much, he’s essentially a boring, sweet man. Yes, he may arbitrary, and is slowly being crushed by the system, and specifically Supernintendo Chalmers, but there is a goodness, and, dare I say it, an authenticity to the character. Mmm … Real Duff Beer From The Simpsons – A licensed version of Duff is coming to Chile. This will apparently be different than the Duff they’re selling at the theme parks since they’re consulting with a “brewmaster”. If legal Duff spreads, will each country get its own brew? That would actually be pretty cool. 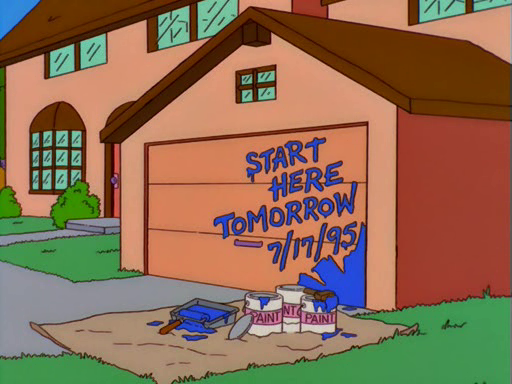 Simpsons street art in Texas – They even got the spelling right. Bravo, Houston not quite comedy club. Bartkira the Animated Trailer – This was making the rounds last week and is really well done. I have no idea how serious they are about actually doing the whole thing, but I’d sure watch it. El Barto – And speaking of Bartkira, here’s some storyboard sketches. 6 exceptional artwork inspired by A Clockwork Orange – A couple of drawings of Bart, Milhouse, Nelson and Ralph as the gang. –Bart: How did the lion get rich? For other examples of the curious or fascinating, take the story about the stagecoach robber whose conscience got the better of him, causing him to return his victims’ money and split a bottle of whisky with them. Or the legend that, in 1915, the wheat crop was so dense that farmers could walk across it. Or the fact Matt Groening’s father — on whom Homer Simpson is loosely based — is from Saskatchewan. Billy and the cloneasaurus – Nice Cloneasaurus graphic. The Simpsons: Everything you need to know from Comic-Con in our live blog – Lots of Zombie Simpsons news, if that’s your thing. SDCC 2015: ‘The Simpsons’ Panel And Q & A – Video of same, if that’s your thing. Yo Man! – Ye olde Simpsons button. Alf Clausen: 40 Years of Music From “The Carol Burnett Show” to “The Simpsons” – A series of interviews with Clausen (via @simpsonology). Eye On Springfield with Jason Cantu of Slaves BC – Best Flanders shirt ever. Smartline – Some excellent Simpsons/album cover t-shirts. ‘The Simpsons’: 8 Fascinating Facts About ‘Marge Vs. The Monorail’ – Just what it says. Nothing really new, but there’s a .gif of Wiggum watching the train go. 10 Lisa-Centric ‘Simpsons’ Episodes – Just that, happily there’s no Zombie Simpsons. Threads | The Simpsons X Neff Collection – More fashionable Simpsons clothing. This stuff must really sell. Adorable ’90s Pop Culture-Inspired Lip Art – The first one is Homer, and it’s pretty neat. The second one is the Cheshire Cat from the 1951 version of Alice in Wonderland, so I’m not sure how that qualifies as “’90s”. There was a Family Guy/The Simpsons crossover and everyone thought it was a bit weird – The U.K. seemed to have as generally low an opinion of the crossover as the U.S. did. Why Lisa Simpson Is An Awesome Feminist – Starting with Lisa, dressed as a Movementarian, shouting about the whole system being out of order was an excellent choice. Daily Drawing 175 – Wonderfully creepy fan sketch of evil looking Marge, Krusty and Bart. Rhymes of History Technology – A look at fictional picture phones, including the rotary version in “Lisa’s Wedding”. If you had to end the show, how would you do it? End? That’s unthinkable. I’d never make the Simpsons end. If I had to, though, the last scene would be Homer and Marge… getting stoned with Cypress Hill. My 5 Favourite Lisa Simpsons Episodes – An excellent list with nothing from Zombie Simpsons. Is it Time Yet?? 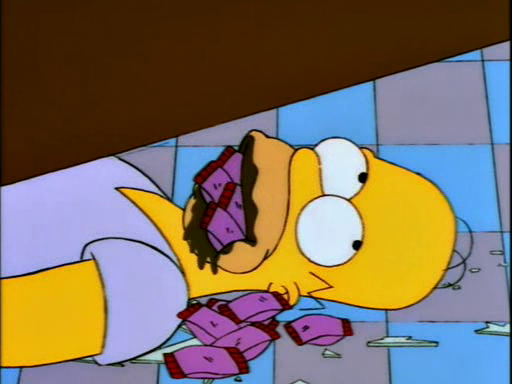 – A .gif of Homer’s stomach rumble from “Homerpalooza”. The best of Groundskeeper Willie – Willie hears ya, Willie don’t care. Lisa Simpson, arguably television’s foremost vegetarian, once tried to explain to her father that bacon, ham, pork chops all come from the same animal. “Oh right, Lisa, a wonderful, magical animal,” Homer retorts. TV Pick of the Day – “Homer the Great” remains great. Fashion Spotlight: All characters must die!, Gotta Train Em All!, and Dragon Peanuts – Arya Stark as Bart writing her names on a chalkboard. Weakest season of all. I can count the funny bits on one hand. Cought myself saying ‘really?’ almost every week. Luckily, some weeks they don’t have new ones.